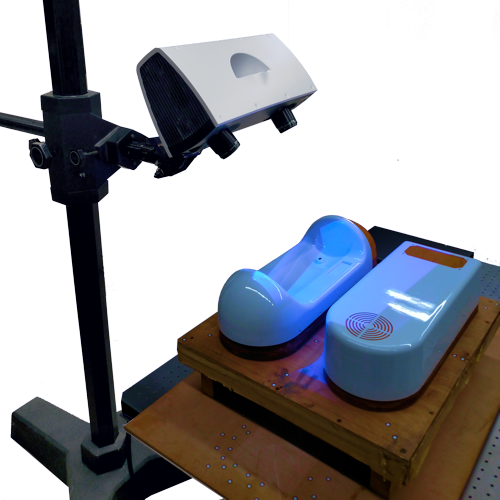 The Zeiss L3D blue light 3D scanner is a high-end metrology scanning solution. Our go-to scanner for high detail, high resolution and low noise. The L3D comes with multiple cameras and lens that can be configured specifically to your application. The most common L3D system has a 5mp camera allowing for a maximum of 5 million XYZ points in each scan. The points are then focused on a specific volume depending on the lens used. You can focus the 5m points on a small 45mm volume giving you a point to point spacing of 0.018mm. Zeiss L3D volume can be increased to 500mm with a resulting point-to-point spacing of 0.196mm. They also offer 75, 100 and 250 volumes. It can be bundled with single or multi-axis turntables, as well as photogrammetry depending on the application.